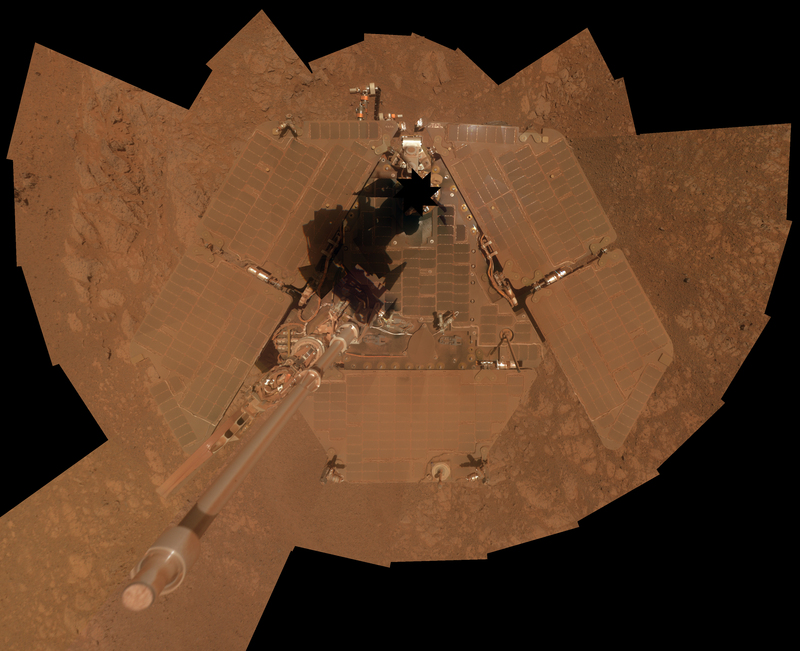 Eleven years into a three-month primary mission the Opportunity rover is still making discoveries on Mars. Talk about exceeding your specs! That is eleven years of observations of rocks, craters, sand dunes, weather conditions and the occasional glance into the skies to do some astronomy. Artistic impression of Opportunity rolling off its lander onto Mars for the first time. 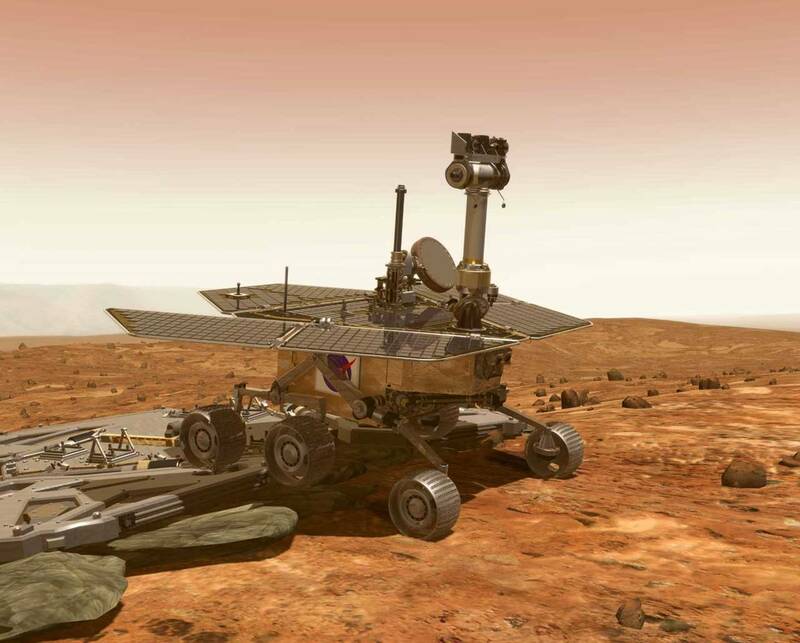 To celebrate its 11th anniversary the rover has just climbed to a high point on the rim of a 14 mile diameter crater called Endeavor. It has been working around the edge of this crater for 3 years after spending more than three years driving to the crater from Victoria crater to the North. I have followed adventures of Opportunity since the day it landed in a tiny crater name Eagle in January of 2004. On the occasion of its 11th anniversary on Mars, I thought I would show a few of my favorite pictures over the years with a bit of back story for each one. I’ll start with screen grab from Google Mars. 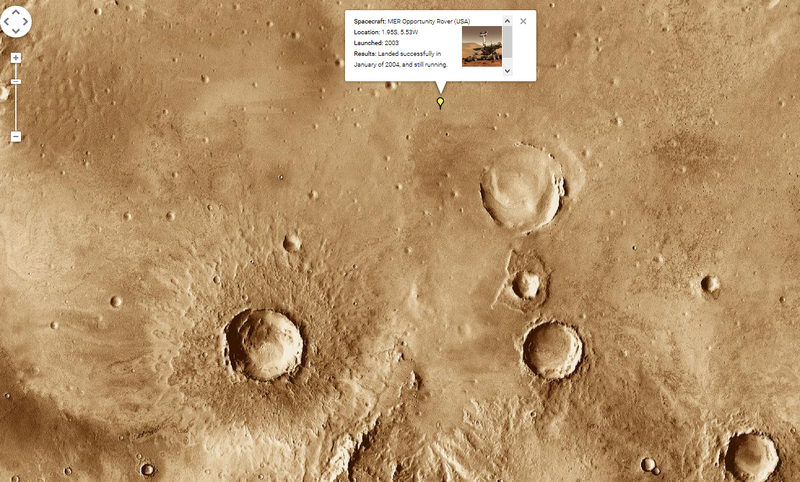 Yes, there is a Google maps for Mars (mars.google.com/)! Here we see a broad overview of the area that Opportunity landed in. There are craters of all sizes and ages here and outside of these picture there are a few craters that dwarf even the largest seen here. Opportunity landed in a small crater itself and then traveled to several others on its way to the large crater to the southeast. I’m going to take you along that trip show you some highlights along the way. Image grab from Google maps of Mars showing the landing site of the Opportunity rover in January of 2004. 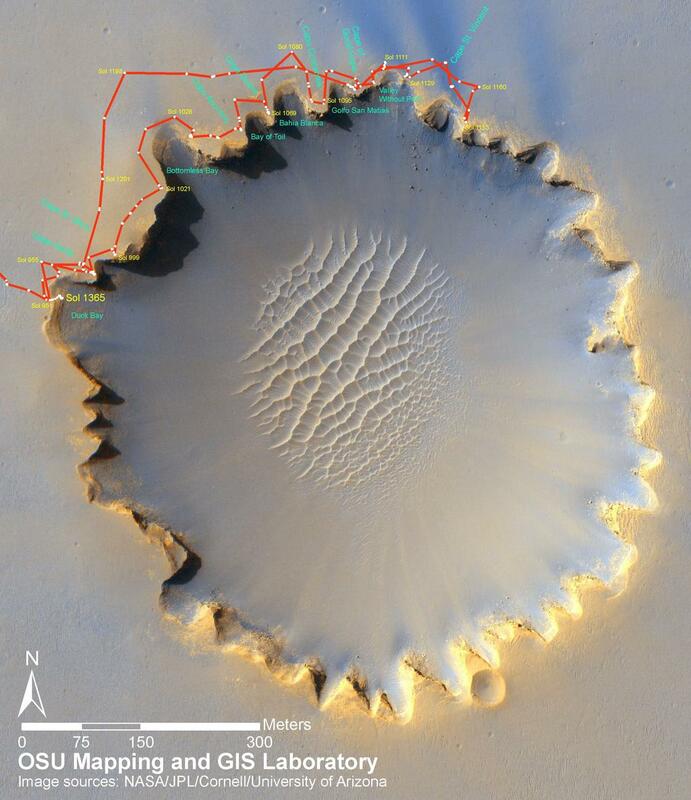 It has since roved 20km southeast to the large 13-mile diameter crater called Endeavor after visiting several small craters not even visible on this map. Image: Google Inc. Opportunity landed inside a small crater. Fortunately it wasn’t one that the rover could not climb out of. Here is picture that Opportunity took of its lander after rolling out of the shallow eroded crater called Eagle. Below is a map of the local region of the landing site and the first year of Opportunities travels. The drive from Endurance crater to Victoria crater at the bottom of the image took around 2 years. The trip from Victoria to the current location has taken another four years. 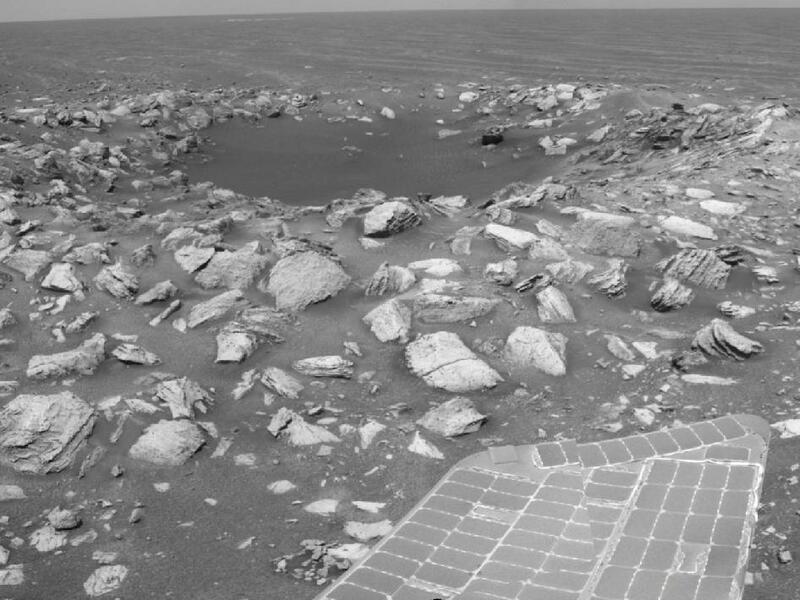 Endurance crater was the first crater of significance that Opportunity was able to visit. I remember eagerly looking at the new images every day as the rover got closer and closer to the crater. Below is the first time that the rim and a tiny glimpse at the inner wall was visible. The apparent layering of the rocks on the wall was incredibly exciting. Finally arrived Endurance to find a beautiful crater with rock exposed on the walls and wispy sand dunes in the center. A closer look at the wall of Endurance crater showing that thinly stacked layers of rock. The top portion of rock is more jumbled probably because this represents rock that was ejected when the crater was formed. Over time those piles of rocks have eroded to form the smooth surface that is present today. More than a year later Opportunity had driven to another crater (Victoria) which is more than twice the size of Endurance. 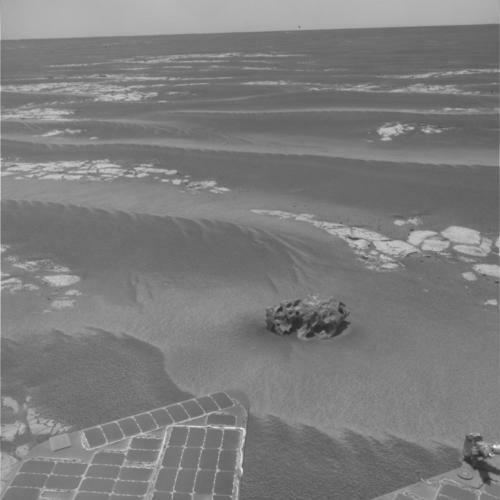 Opportunity spent more than a year driving around the rim of Victoria and dipping its toes into a small bay to analyze the origin of some of the rock layers. Notice that there is a small crater on the southern edge of Victoria which must have formed at some point much later. Victoria must be a very old crater since there is no jumble of debris around the rim. The rocks that were thrown out of the crater on its formation has been worn down smooth in the area around the crater and the crater walls themselves are nearly smooth. But it hasn’t completely filled in with material so this crater is relatively young compared to many others in the region that look even more worn down. Victoria crater from satellite imagery with the movements of the of Opportunity mapped onto it. Below is an image of the crater wall of Victoria. The material above the light rock is all debris that was thrown out of the ground by the impact. 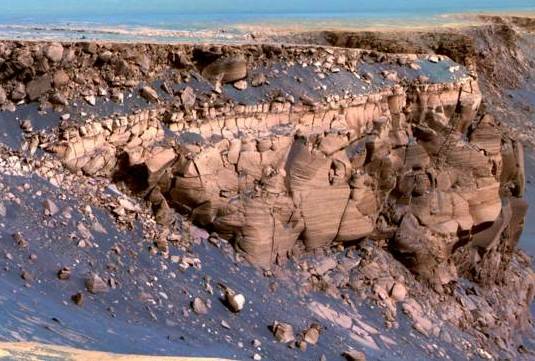 It includes an inverted rock (upside-down layers of what is below them) that are broken up. This layer of impact ejecta was probably 10s of feet higher in the past but that pile of debris has been eroded down to the smooth surface you see today. Victoria is estimated to be 10 to 100 million years old which makes it quite a youngster. 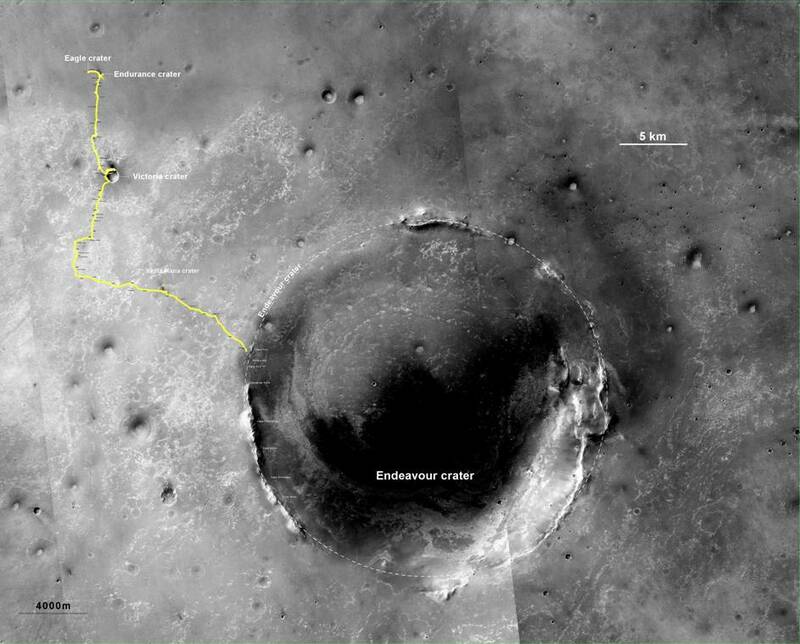 After leaving Victoria Opportunity was on its way to the distant Endeavor crater. At the time it was estimate that it would take at least three years to get there. It ended up taking four with many stops along the way. Along the way it visited many small craters some of which were nearly completely eroded and some of which looked quite new. Below is a small crater that seems to be relatively fresh. Of course, new may mean 100,000 years old. In this case the rover observed that the ejected material was strewn on top of the small sand dunes that are ubiquitous in the area. 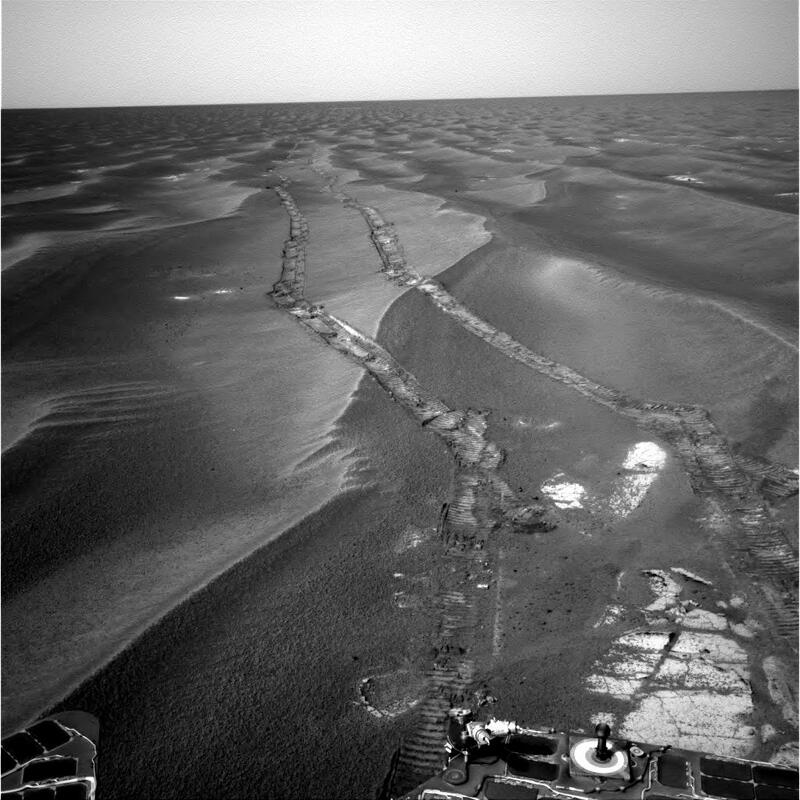 Between craters Opportunity has driven across many miles of terrain that looks like what you see below. Small wind blown sand dunes on top of a pavement of bedrock. There is one unusual feature in this picture and that is a rock that is obviously different that the rest of its surroundings. 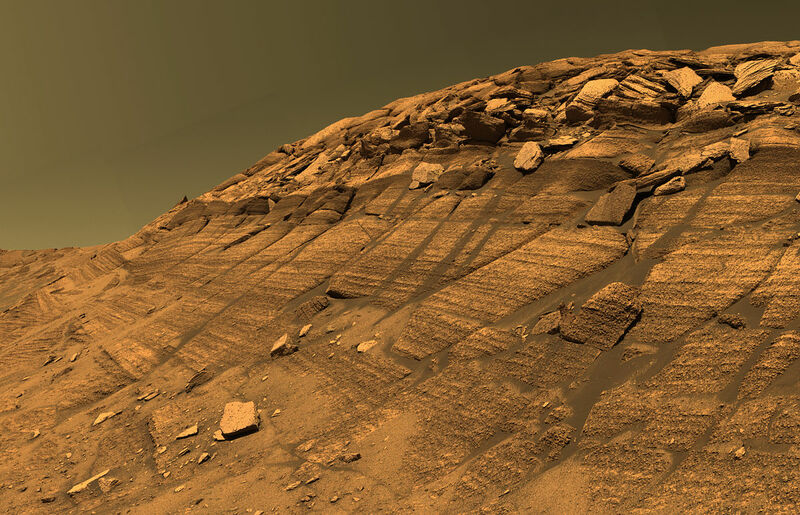 Using instruments on its robotic arm Opportunity was able to determine that rock is composed primarily of iron confirming the hypothesis that this rock is not a martian rock but rather a meteorite that has fallen onto the Mars surface. 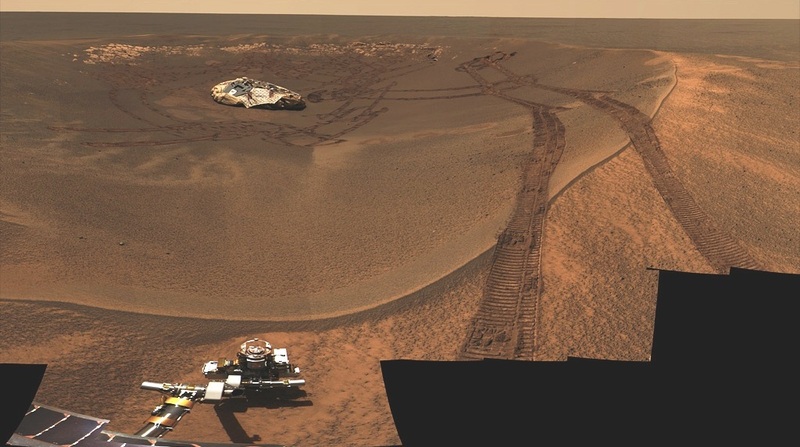 To get some perspective on the size of the sand dunes the picture below shows the rovers tracks. The rover itself is about the size of a riding mower. Some of the sand dunes that it came upon later were larger and at one point the rover got stuck in a dune for several days. 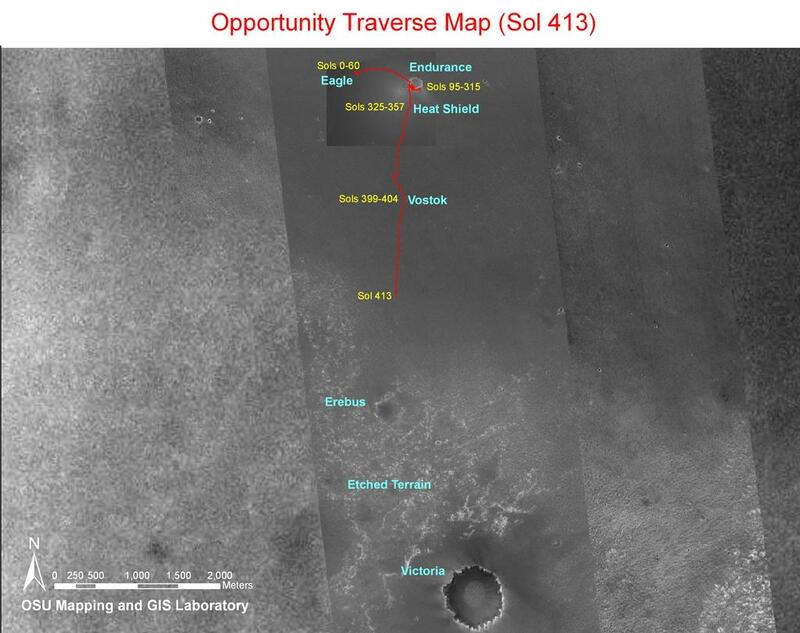 Here is a map of the path traveled by Opportunity to get to Endeavour. It has now been working its way around the rim for about 3 years. This crater is huge (13 miles in diameter) compared to the others. It should also be apparent that it is far older than Endurance or Victoria. 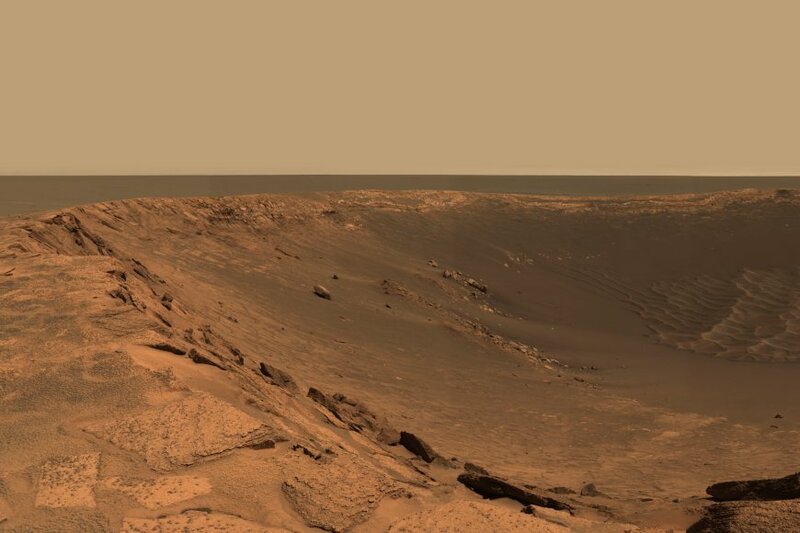 The crater is nearly full of sediment and the hills that make up the rim are probably just stubs of what they were after its initial formation. A picture from its location at a high point in the rim of Endeavour 11 years after landing on Mars. 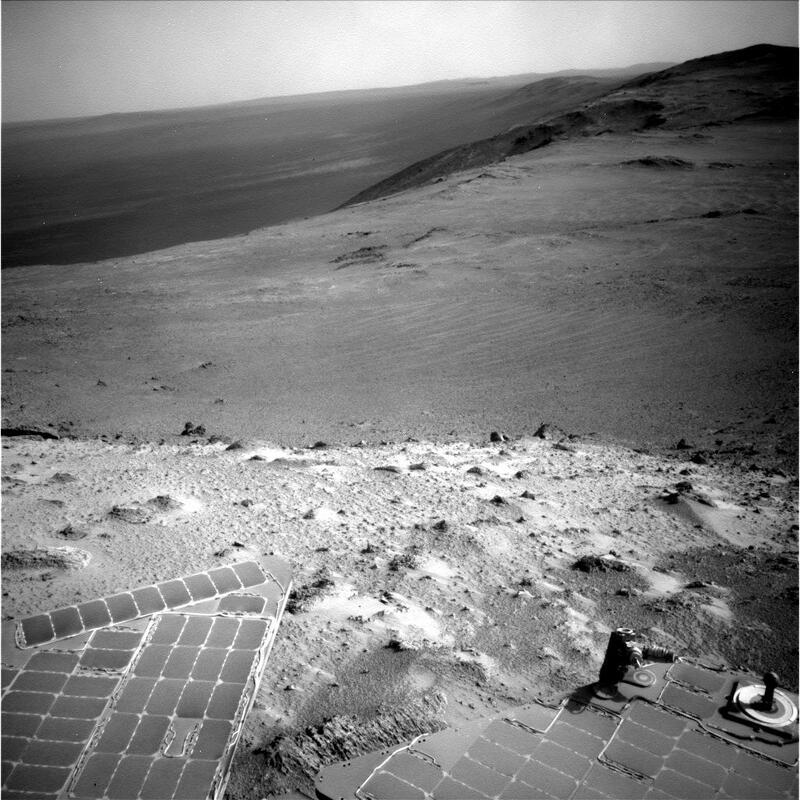 Opportunity is now looking a lot like the place it is visiting. Red dust covers the rover but enough light is getting through to the solar panel array that it can continue to operate. How much longer will it survive? Opportunity has been saying it thought it could for 11 years. Any day could be its last but Opportunities operators have been saying that for 11 years now. For now Opportunity thinks it can keep going. I think this is incredible. Have you ever read Ben Bova’s science fiction? It is the only sci-fi I’ve read that really captures the excitement of exploring our solar system, interwoven with human struggle. When I see these pictures they just bring to life what Bova described already in his books on Mars. It’s like science fiction becoming real. So awesome! I’ve not read much of his stuff. Only one that I can think of is Moonrise but I have his Mars book and never read it. I’ve always heard good things just never found time.